The Omega II card counting system is another advanced technique for pro blackjack players. It was developed by Bruce Carlson not long ago and published in his book Blackjack for Blood (2001). This method is more complicated than the Hi-Lo or Knock-Out systems and it's recommended to learn the basic ones at first. It is believed that the betting efficiency of the Omega II card counting system is up to 99%. Thus if you master this technique you know for sure how much money to bet, to stand or to hit, double down or split. In close liaison with the basic blackjack strategy it provides you with a powerful weapon against the casino odds for winning and your chances to loose. The Omega II card counting system belongs to the balance type. The mechanism is more complex than the regular -1/0/+1 system. Such complicated structure causes the high-level accuracy and efficiency of the Omega II card counting system. Let's try to sort out the data given in the chart for your better understanding of the count procedure. 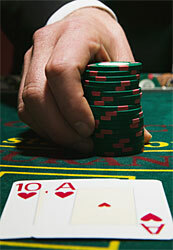 You may improve your chances for winning by adding one more tip to the Omega II card counting system. It deals with Aces. If you count how many Aces are dealt and how many of them are still present in the deck you may increase your odds significantly. Yes, it's a separate and additional count, another load for your brains. But still be confident - the thing is worth the effort. Each of card counting systems (the Omega II is not an exception) possess the same chief aim - to wait for a highly positive count. That means the less small cards stay in the deck and thereby the chance to get a big card is high. And vice-versa - the count is negative which means the majority of big cards are dealt and the small cards mainly form the deck. The strategy is to bet more with positive count and make low wagers having a negative count on your mind.